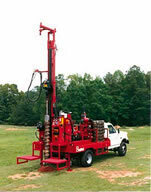 Exceptional durability and a wide range of custom features specifically designed to meet the needs of drilling monitor wells, taking soil samples, and foundation enforcement. The DR 30A is an auger-only version of the DR30. Available with gas or diesel engines, it uses both solid or 2- 1/3" ID hollow stem augers. The DR 30A is ideal for small diameter, shallow monitoring wells or soil sampling. It comes with a 5' stroke, 18HP gasoline engine standard and a dual hydraulic pump. 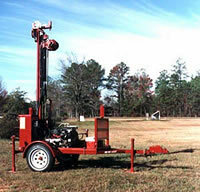 The DR 40A is an auger-only version of the DR40. Like the DR 30A it is available with gas or diesel engines. 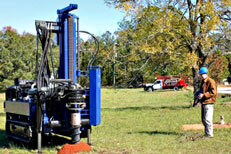 With a powerful hydrostatic drive, the DR2K is designed specifically for soils investigation. It is available with cathead, automatic samplers, mast extensions, sliding base for off-hole work, grouting pumps and many other popular options. Available as a skid, single or tandem axle trailer or truck mount. The DR5K is the same physical size as the DR3K but with more torque for larger augers. Additional pullback is provided for even greater depths and more safety in difficult formations. Available as a skid, tandem trailer, truck, track, deck engine or PTO. 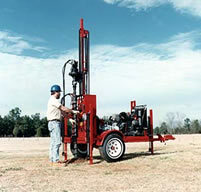 The DR10K is an extremely powerful and versatile soils investigation drilling rig. Large diameter hollow stem augers are easily handled; with the swing-out auger racks, and extending and swinging jib boom, tool handling is performed with a minimum of manpower and muscle. Options include the grouting and mud pumps, fixed or hydraulically extended mast extensions, a variety of winches, a short mast ( for low overhead clearance or a long mast for drilling with 10' drill rod. 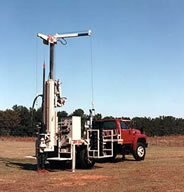 Designed for small diameter, shallow monitoring wells and soil sampling. 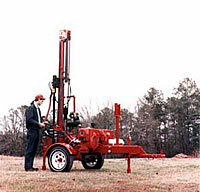 The DR30 has a small mud pump with swivel and plumbing for rotary mud, when necessary. 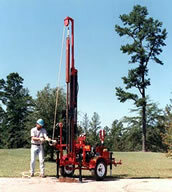 Additionally, the DR 30 will run a small, down-the-hole hammer using an auxiliary air compressor. Every DeepRock rig is produced with the same dedication to quality, durability and craftsmanship that has made DeepRock products legendary since 1962. The ever changing needs of the the industry have inspired DeepRock engineers to develop new, innovative and cost-effective solutions to difficult drilling problems. 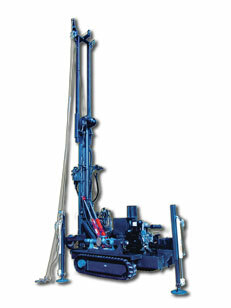 The results are a diverse line-up of auger rigs to meet the needs of the most demanding user. Whether for soils investigations, mining, or sampling work, DeepRock has a portable, commercial grade auger suited to your needs. From the standard line up of versatile rigs to the remote-contolled DR7K-TK track unit DeepRock can customize almost any rig to the configuration that best suits your needs. 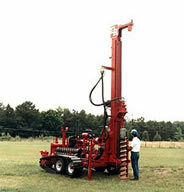 DeepRock also makes tractor-mounted auger rigs, such as the TR5K pictured at the top of this page. As with all DeepRock rigs, complete engineering and technical support is provided by DeepRock's engineering staff. If you can envision it, DeepRock can engineer and built it .